Welcome to my blog. So glad you stopped by. My name is Theresa and I am so excited to be a part of Vicki's 2 bags full " Grow your blog party". Check out the party by clicking the highlighted link and surf through almost 600 wonderful blogs. My passion is interior decorating. I have decorated homes for friends, family and neighbors. I have always had a desire to create cozy spaces in every room of a house. I like to think outside the box. It is my mission to give every reader of my blog ideas that can inspire you to not be afraid to try something new with colors, patterns, furniture arrangement, and re purpose old pieces and incorporate them into your home. My husband and I are also renovating an old 160 year old flour mill into our home. I'll show updates on our mill as they come about. We have also renovated an old railroad depot into our home that we currently live in until the mill is finished. My hubby and I also like to create useful pieces from odds and ends junk to something useful. We have 2 wonderful dogs, a 2 year old silver lab and a 6 month old Golden retriever. We have 4 sons all grown up now. 6 grandchildren that are the best! I hope that you will follow us on our journey as we create a home from an old dilapidated flour mill. I also tend to rearrange and decorate my home often. You just never know what I may post that has to do with my home, my life, or my style! So stick around. Look forward to making new friends! Today I have been redecorating my bedroom. I purchased a new duvet and shams from the Pottery Barn. If you don't know yet, it's one of my favorite shops! And I also love old textiles expecially old ticking material. I have this large old ticking mattress cover that I had purchased a while back from an antique store in my area that I think I will make a sham or two out of for the bedding. I think it goes nicely. As you will see in the pictures, I placed the old ticking material over my white shams to see if it will work....and I believe it will work fine. I am a huge fan of blues and whites together. The duvet and shams material are sort of like a linen. Does tend to wrinkle a bit. Hope you like it. Now I think I'm going to take a nap in my new bedding. Your posts are always amazing, Theresa! Ooooh.... I love that bedding. I can imagine a good long nap or a cozy read all curled up on a cold cold day. I'm popping over as part of the GYB Volunteer Team to say, "Welcome to the Party!" I'm having a blast strolling through all these worlds... and am glad to find your lovely corner of the blogoshpere. Hi, I just popped in from the GYB party. Your blog is fabulous and the pictures of your home are stunning! I look forward to see more in the future. Your home is just beautiful! Those blues and whites are so soothing. I look forward to more of your posts. Hi Theresa -- Welcome to the party -- I hope you make lots of friends for your beautiful blog. Could you PLEASE creatre a link to my party post for today somewhere in this blog post? Thanks for being a part of the party! Theresa, thank you for stopping by my blog and I have to say, I am really excited to see how your home renovation turns out, how unique! I recently bought some "ticking" at an antique market in Munich. Some were old flour bags and others are kitchen towels with someone's initials on them. Not sure what I will do with them just yet--probably pillows. Good luck with "GYB." I think your grandma comes from Schliersee or Schlier Lake, it's not far from Munich. I am a new follower! Hi Theresa. Thanks for joining my list of followers, I loved your bed make over. I wish blue ticking was as easy to find here in France. I think all the antique dealers snap it up & sell it on at an extortionate price. Look forward to seeing more of you. i love the bedding. I do love blues and whites together but never manage to be able to exclude all the other colors. And thank you for stopping by my blog. hi there. i'm Beth from E. Lizard Breath Speaks - so nice to meet you through the Grow Your Blog get together/party. Love the look of your new bedding and the ticking will mix beautifully! I'm intrigued about your renovations so I'm going to be a new follower and look forward to seeing more. Ahhhh...visiting from GYB party and you TOTALLY have my attention with your interior decorating. I am your newest follower and so happy to have found you! 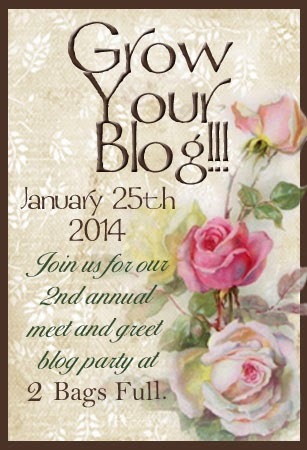 HI, popping over from the Grow your blog party. How lucky that you have such a wonderful old house! We also renovated our house, although it was only from the 70's...I also love re-purposing stuff, too many wonderful things get thrown out! I found you during the GYB party and really enjoy your blog. I will follow as you create a new home from the old mill....so exciting for you! I'm following your blog as a result of this fabulous GYB party. I love your taste in design and am excited to follow you on your journey. Hi Theresa, what a wonderful thing to be able to do, and not to mention fun. Renovating interesting places that most folks would not even think of being made into a house and making them a home. You have a very beautiful home and I really love the photos on your blog. I found you through Vicki's GYB party. I look forward to strolling through some of your past posts and your new posts on how the flour mill is coming along. I love the blue and white bed. So pretty. Your bedding is absolutely beautiful. How fun to be redoing an old mill. Wow Theresa I can't wait to follow your blog because your decor is just amazing. Love the blue and white pics AND your Christmas pics - beautiful! I am a new follower! Hey Theresa, your blog is lovely. I too like blues and whites together but out room is reversed, blue walls with white bedding. Your bedding is lovely! It has been nice meeting you. lovely home, visiting via Vicki's GYBP and think you'd enjoy Miss Mustard Seed's blog as well. I love your home! I have signed up to receive your RSS feed. Thanks for sharing.